Helping to bridge the gap between the real world and the world of the app. With the new year comes a new opportunity for reflections on the past and the weighing of your future paths. For me it also means I have produced a new personal annual report. My annual report is a combination of quantitative as well as qualitative information. Beside the traditional quantitative numbers, I provide qualitative context, some stories, to help people understand the data. Qualitative data is the kind of information that can’t be tallied or analyzed like numerical data but is still incredibly valuable. It is the how & why of human behavior. Qualitative data can be the insights gathered during user testing interviews, the explanation of the stock market at the front of a mutual fund prospectus, or even just knowing that soup is served warm and generally doesn’t sell as well in hot weather. It’s the real world context and stories behind the numbers that help you understand what is going on. Our everyday lives are full of qualitative information. 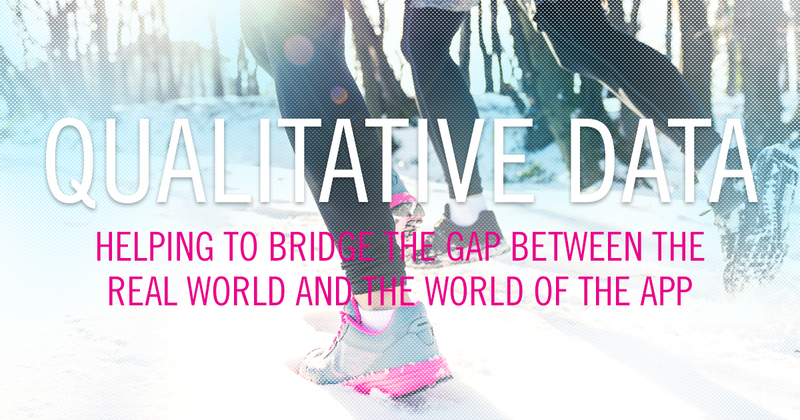 We are constantly using qualitative sensory information to navigate the world. Based on how and why I have done things in the past, how or why should I do something now? I run in the winter and I know I should adjust my running speed & style when approaching a surface that looks wet as it might actually be ice. I don’t have any quantitative data to support this decision but I have lots of qualitative (sometimes painful) running experience to support this decision. Qualitative information helps to make applications more accessible because it bridges the gap between the real world that we all live in and the world of the application. The world of an application is a specific place with its own data and its own rules. It can be difficult to understand an app unless you are familiar with the numbers it displays. Qualitative information helps give context as to what part of the real world an app is analyzing and why. You can use more technically savvy solutions to help dynamically narrate what is happening within a data set, or you can go low-tech and simply write a paragraph of text giving context to a data set, or to a particular chart, etc. However you get there, the key is to help users make the connection between the world of the app and the world they are already familiar with. Data literacy is increased through qualitative information. Dr. Brené Brown said that “stories are just data with soul” and the best way your quantitative data apps will get a soul is by including qualitative information.